....some photos of my sister's cozy, warm, inviting, time worn, colorful, cottage inspired home with you. My sister and I both share the love of decorating our homes. My Mom and I went up to visit my sister last week at her home and we enjoyed lunch, conversation and laughter together. I wish my sister lived a little closer so we could get together more often. She lives about forty-five minutes from me. Her life is also busier than mine since she still has two boys at home and her fire fighter husband has an irregular schedule. My Mom and I always check her schedule first for us to get together and have a girl's day out. Last week we didn't go out so we stayed in and had lunch. Of course since I blog now I had to take my camera in order to take some pictures of her home to share with you. Some of you probably saw some of her home before on Nancy's blog, the Southern Lady, over a year or so ago. My sister makes changes probably more often than I do though so it will not look the same as it did. The first room I am going to show you is her living room /sitting room. This is the first room to the right when you come in her front door. She has many great antiques mixed with flea market finds and some new pieces from home decor and consignment stores. This chest is very old and I love the open shelving piece she hung above it that she found at a flea market last year. I really wish I had seen that piece first I probably would have had to fight her for it! It is a beauty. She has placed white ironstone dishes, transferware, and silver pieces on it. I love how she has flanked it with two bird plaques. This is an old chair that she has thrown a cranberry slipcover on and then layered it with a beautiful throw and a gorgeous aubusson pillow featuring pheasants. If she finds it missing I hope she doesn't look here. My other favorite piece is this very old secretary. I love the patina of this piece and the wonderful lead glass panels. They just don't make them like this anymore. There has to be a pretty tassel hanging on the door. It is a Southern thang ya know! She has created a very nice vignette on the secretary desk top with the Staffordshire cow figurine, lamp and decorative key. Love the lamp with the stenciled lamp shade and look at the size of that key. The leather is worn and cracked which gives it such great character. A close up of a recent silver piece she found. I love the way it looks behind the lead glass door. She painted this chair black and recovered the cushion with this pretty plaid fabric. They just had these hand scraped wood floors installed a few months ago. I love the wide planks. This is the other corner of the room with a round table covered in the same fabric as the chair cushion and some pretty floral prints from a local flea market. Wish I had taken a better picture of the table. Here is the view of that room from her family room. Another great piece in that room is the old column. She just placed a wire urn filled with a plant on top of that. Such a great way to fill an empty corner. I will share more of her house soon. I will have to break this up in segments so it doesn't get too long. I hope you enjoyed this room in her house. I love going there and visiting because it has always changed by the time I come back to visit. Please be sure to check back for the continued tour. I am joining Marty's Tabletop Tuesday party. You can click on the link HERE. Please be sure and check out all the other party goer's tabletop vignettes this week. I appreciate all the comments left for Bailey's post. She had a wonderful time and I did, too getting a break for the weekend. It is always good to come back home though. Please let me know you dropped by. Welcome Back Kim! !~ You and your sister definitely share a talent....that is nice to have that in common. My sis and I do not have that in common...she is a minimalist huh!~ Your sisters home is beautiful! Kim your sister's home is beautiful and filled with such lovely antiques! I'm glad you had a nice visit with both your sister and your mother! Thanks for taking us along to sneak a peek at her wonderful home! Kim, glad you had a wonderful time with your mom & sister I enjoyed the tour of your sister's home & I love her secretary! Have always wanted one. Just beautiful! You two are so talented. Is your mom the same way? I love your sister's home. The shelf in her living/sitting room is very unique with wonderful features. My eye went right to her transferware . Looking forward to future installments. Thank your sister for her home tour. Your lunch with your Mom and sister sounds so nice. Can't wait to see more photos of your sister's beautiful home...beautiful decorating must be genetic in your family!!! Such a great tour of your sister's lovely home! You are both such gifted decorators! I really enjoyed seeing your sister's house and decor! Everything is just beautiful! I love all the antiques and accent pieces! You both are very talented, I bet your mom is too! I can definately tell you are both from the same family. I love her style so far and cannot wait to see more. LOve your sister's home. It looks so inviting and warm. Glad you and your Mom were able to spend time together with her! How pretty your sister's home is! It's wonderful that you have her and your Mom close by for fun times together! Your sister has a beautiful home. What fun! I just joined your follower list....I love your display and that great furniture ! Your sister's home is lovely. I wish my sisters only lived 45 minutes away instead of 1200 miles...too far, the older we get. So pretty!! You girls should go into business! Kim- I've loved seeing photos of your sister's lovely home- looking forward to more! I can see good style runs in your family. Such beautiful pieces! I really like that wall shelf and pretty lamp. Thanks for sharing! Your sister's home is just gorgeous!!!! How fun to have a sis who shares in the love of decorating too! I wish someone....anyone in my life took even the slightest interest in decorating. Most of the time they just look at me with a dazed look and then their eyes glaze over and they drift off!!!! LOL...Can't wait to see more :o) Have a great week! I love home tours and your sister's place is very cozy and welcoming and what I like best, no cookie cutter matchy matchy! Thanks for the tour of your sister's home. It really is beautiful but I have to be honest and say, I like YOUR house/decor better! The room is lovely but the tassel thing? Well girl you are talking to a tassel hanger from way back so maybe its an Ossie thing too!!!!!! Your sister has a pretty home and love the antique pieces. Can't wait to see more! 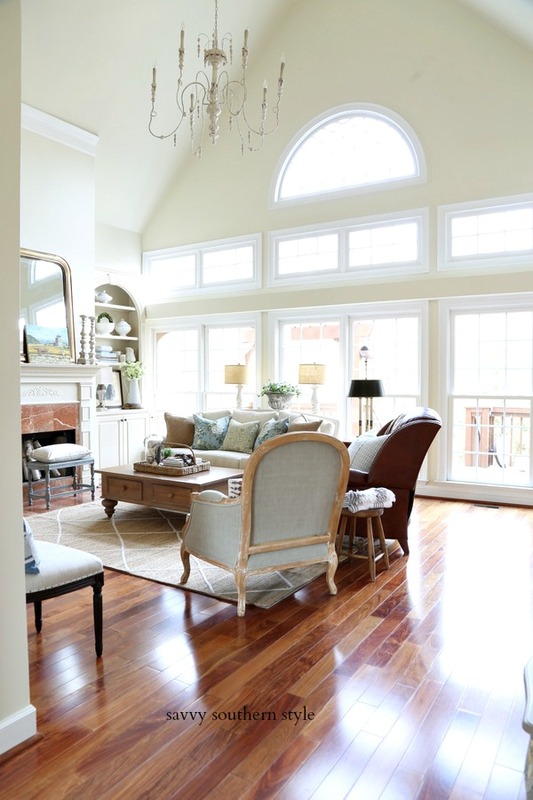 The updating of your home is wonderful and very fresh looking. Loved Bailey's post, as well! I love the desk. Everything is some warm and inviting. Thanks for the tour. I love home tours! Your sister's house is very pretty - love all the antique pieces! Kim, thanks so much for showing us your sister's home. It's absolutely beautiful! What a lovely home and so well decorated. Thank you for sharing these photos with us..
Love that tassle hanging on the lamp..
Hi sis! 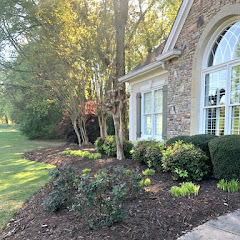 Thanks for posting pics of my home on your blog. That was such a sweet thing to do. I have enjoyed reading all the nice comments. Everyone has been so friendly (except Dining Delight). Ha! No, I'm just kidding. You'll have to warn everyone that I'm never satisfied over here so I'm still "a changin" stuff as I write this. You saw I switched the rugs in the family room and kitchen. Well I've also changed the decor on the foyer chest and the wall above it. I really like the change. I'll shoot you a pic in a little while. I'm thinking about repainting my dining room a different color too. Help! I need therapy for this! 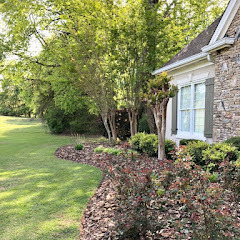 Hope you had a nice weekend and I know what you'll be doing all week........ working in your yard! It's supposed to be beautiful the rest of the week. Finally! Hey, Kim, your sis's house is just beautiful too. 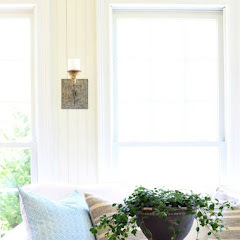 And I'm loving all your familyroom changes for spring. 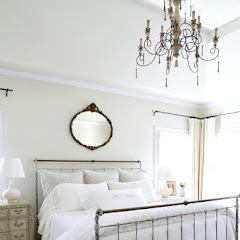 So pretty, love the slipcovers & your light & airy rug and all those pretty accessories that you've collected. Great job, just wanted to tell you that! I love your sister's secretary, Kim! And, I want that key! Great tour of your sister's place. Looks like you both got the decorating "gene"
that's beautiful indeed :) and very inviting too! love the classic taste. you know this can be link too Mary's Ruby Tuesday too :) see yah there! Your sister has a lovely home. I especially love the chest and shelves in the first picture. Looks like great taste runs in the family. What a beautiful house your sis has! I love it all! I've always been crazy about secretary desks but I don't have one ;-( I agree about the tassel thang...I have to have them everywhere! I love her secretary too! She definitely has a talent for decorating. Love her style! Your sisters house is beautiful!! Wish I had you ladies to help me decorate!! Kim, I'm enjoying browsing through some of your posts while drinking my coffee this morning. What a treat! Your sister's house is lovely. 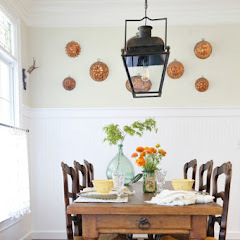 I am especially crazy about that antique dresser with the hutch hung on the wall above it! Then those beautiful oval shaped items that are hanging on the wall on either side. I'm so glad I found your blog - I have decided to add it to my list of favorite blogs on the right column of my blog. You're very talented! I just read your comment on my blog - you should definitely have a space to sell things - "that" is a dream of mine! I am considering doing that too since I can't seem to stop picking up old pieces that just need a little bit of my 'help' bringing them up to par! Don't have room for them all in my own house (sure wish I did!). Looking forward to more of your posts. Your sis ter has a warm and lovely home too! That secretary is gorgeous! My mother has my grandmother's secretary...it is a bit worn but I like that! Gives it such character! They are such stand out pieces t see but also to use!